Paul Michael Szep is a two time Pulitzer Prize winning editorial cartoonist. ﻿ His books, Fooling Most of the People All of the Time; Not Just Another Szep Book; and Smile Damn Ya Smile, are part of the Upton Bell Collection at UMass Lowell Libraries in O'Leary Library, 2nd Floor Special Collections and include personal inscriptions. Mr. Szep's son Jason Szep is also a Pulitzer Prize winner. They are among only a handful of father and son winners. Paul Szep and 4 other political cartoonists discuss their work. At the Boston Globe since 1966, Szep has twice won the Pulitzer Prize. 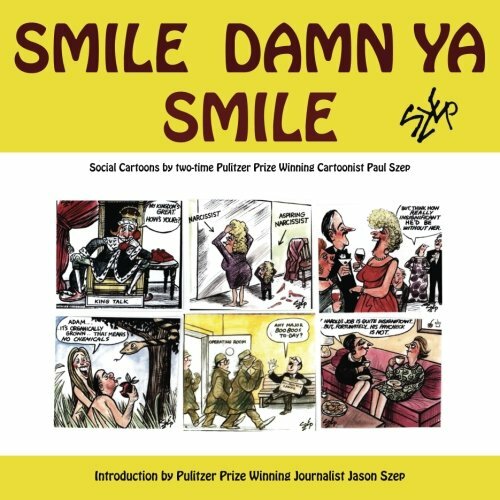 Original social cartoons with beautiful artwork that are playful, insightful, entertaining and stimulating.A great book for gifts or to keep on your coffee table to lift your spirits and make you laugh.